Imagine if Kansas had made an entire album out of the song Cheyenne Anthem capturing the heartbreaking story of a legendary tragedy. Well, they didn’t, but Vertical Alignment, from Atlanta, Georgia, have. After an arduous process of recording and trying to keep a band together, ten years in the making, this epic work of history and art was finally brought to fruition through the organisation and talent of the group around a year ago. 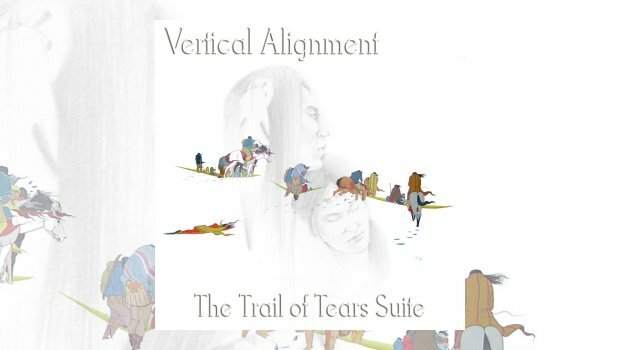 The Trail of Tears Suite captures the feelings and emotions that this horrific journey must have brought to those who participated, Vertical Alignment writing beautiful and sometimes dark poetry with the lyrics to the song as the band tells the story of this epic voyage into darkness. The music matches the magnificence of the lyrics. The keyboards are some of the best of 2017 and the electric guitar solos throughout this epic are well supported with deep bass and solid drumming. This is one of the best epic storytelling albums of recent years. Please give the album a try, especially if you like Kansas, Genesis, and some of the leaders of progressive rock in the 1970s. Although there are many reminders of the past, Vertical Alignment play this music with more updated influences too. I doubt you will be dissatisfied with this epic story and album.